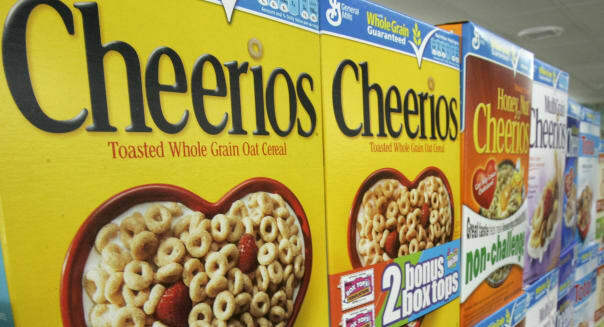 General Mills said it has stopped using genetically modified ingredients in the popular breakfast cereal Cheerios as the U.S. branded foods manufacturer hopes the move will firm up customer loyalty in the face of growing opposition to such additives. Many activists and critics have cited studies showing that genetically modified crops aren't safe for people and animals who consume them. Some activist groups opposing genetically modified food also say the crops create environmental problems by encouraging more use of certain agro chemicals, and consumers should have the right to know what they are buying. However, General Mills (GIS), which also makes Betty Crocker dessert mixes and Yoplait yoghurt, said in a company blog post Thursday that its decision on ingredients wasn't driven by safety concerns or pressure from critics. "It's not about safety. %VIRTUAL-article-sponsoredlinks%Biotech seeds, also known as genetically modified seeds, have been approved by global food safety agencies and widely used by farmers in global food crops for almost 20 years," the General Mills blog said. The Minneapolis-based company said it has begun using non-genetically modified cornstarch and non-genetically modified sugar in Cheerios, adding that oats, the primary ingredient, is a crop that is not grown from genetically modified seeds. The company hopes that "consumers may embrace" its decision to move away from genetically modified ingredients. In November, a Washington state ballot measure that would have required labeling of foods containing genetically modified crops didn't win wide approval. A consortium including General Mills, Nestle USA, PepsiCo (PEP), Monsanto (MON), DuPont (DD) and other corporate giants, were key contributors to the roughly $22 million raised to campaign against the bill.